1. Dollar Store- I talked about this in length here but I honestly believe that you need to pop into the dollar store prior to any other store. There are so many things you can find there for much less than you can find elsewhere. Of course there is a lot of junky things as well, but simply walk in and take it aisle per aisle. I promise you will find a multitude of things that you need or even forgot that you needed while you are there. 2. Ibotta/Meal Plan- This is quite possibly one of the most important things you can do for yourself or your family: meal plan. I got tired of so much food going to waste and one time even our entire fridge had to be thrown out. Those Texas storms are aggressive and we went all day without power. It killed me to see hundreds of dollars be carted off. Become a strict meal planner with wiggle room only for snacks or for that emergency meal you need to put together in case you didn't get to the grocery store the day you intended to. Write it down and stick to it. Refrain from impulse buys. You do not need 3 cartons of ice cream (yes I do) but these things add up to a very scary amount. I have been meal planning with Ibotta since January and I will never go back. Not only has meal planning become easier this way but I can also take advantage of their rebates and MAKE money using them. Is it so easy and quick that it becomes second nature to you. Join my team and let's unlock rebates together! 3. Make Your Own Coffee- It is so tempting (and delicious) to just pop into Starbucks or your local coffee shop and pick up coffee on your way to work. Just swipe that card and be on your way! Hit those breaks my friend! Let's do the math. Let's say your daily coffee is $3 and you stop in there 5 days a week. That is $15 that you are spending each week. That is $60 a month. And that is $780 a year! Who died a little bit inside? Now really think about what you pay for your fancy coffee. It is more like $4.50 right? Because you didn't just get regular coffee. You got a FANCY coffee with all the frills. At $4.50 that is $22.50 a week, $90 a month, and a whopping $1170 a year! I was crushed when I did the math years ago. I was a daily, sometimes twice daily, Starbucks junkie for years. I was addicted to say the least. Then one day I got transferred for work and there was no Starbucks in sight! I had to slowly ween myself off of it and that is no small quest my friends. Funny side effect though, I noticed more money in my bank account come pay day and in the long run. I couldn't figure it out at first. I even checked to see if I had received a small increase or something. I pulled my expense report and saw the drop off of Starbucks transactions now only limited to maybe on a weekend. That made me do the math and then realized how long I had been doing this. I was not happy with myself. I recommend you take your hard earned cash and invest in a coffee machine. Don't go overboard as I can almost guarantee you if it has too many bells and whistles, you won't use it. Instead, purchase some really good coffee or a variety of them if you want. If flavored coffee is your thing, buy a bottle of your favorite syrup. Recently I bought husband a $20 bag of amazing coffee that he had tasted at a really nice restaurant we went to. While some of you may balk at the price point think about it this way. When compared to what a cup of coffee costs at the store, this bag payed off in five delicious mugs of coffee. Needless to say, that bag lasted about a month. 4. Plan Your Errands- I pass by every single store you can imagine on my way home from work. I could literally get off the freeway 5 times and hit every major store that plays a part in my life. That is why during the week I make it a point NOT to run errands here and there. Instead I wait until Friday making my stops in consecutive order in turn saving gas, money, and time. No more running around town for me. I start at Dollar Tree and work my way down home. Plan out your next errand day and see how much faster this can go for you. 5. One Man's Junk Is Another Man's Treasure- Before purchasing a big ticket item, such as furniture, give research a go for a bit. Online garage sales through Facebook are great places to start with. Most are marked for a quick sale and you can see what the item looks like right away. Do you absolutely need to buy or can you borrow an item from a friend? Put it out there at work, send a mass text, put it on Facebook. Someone is bound to have what you are looking for and won't mind lending it to you. I can't tell you how many times this has worked for me. Even for my rehearsal dinner. I needed glass pitchers. I ended up borrowing them from a friend of a friend who did not mind at all. Then of course their is always a traditional garage sale, Goodwill, Ebay, and Craigslist among others. You would be surprised with what people are willing to part ways with. 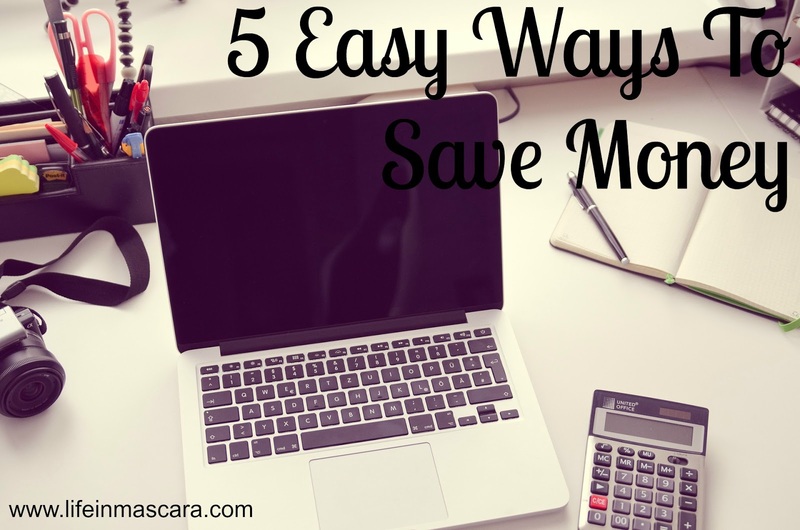 What do you do to save money on a daily/weekly/monthly/yearly basis? I love #4 and just started doing this recently - on Thursdays I do all of my errands in one sweep and map them out (for the most part) to save gas - and keep groceries from spoiling - I did it to save time and money but I didn't realize how great it would also feel to not be running petty little errands every single day! Right? I feel less tired as the week progresses when I am not running an errand every single day after work. I assume my brain feels like it had more time to rest at home. Yes! Dollar stores have some of the best deals! I've found a lot of great beauty products that way and they were all a dollar! I'm also a definite believer in planning out my shopping trips. It's like the old saying goes, if you walk into a grocery store hungry, you end up buying things you don't need. I try to stay the course of what I plan every time I shop! That saying is so true isn't it? I used to throw more snacks than meals into my cart but now that I sit and plan I have full meals for the week. Plus it saves me time in the store as well as money. Dollar stores are sometimes good and sometimes bad. Just because something is a dollar doesn't mean it's actually cheaper - I've learned that. And yes, meal planning is definitely something that saves us a lot of money! Yes that is why I say they can be hit or miss but if you need something only for "right now" like party decorations or trinkets then there isn't any harm done. All great tips! I have downloaded Ibotta but haven't used it just yet..looks like I need to get on that. You do! Plus you can use what you make to pay for things for your wedding like I did! Great tips, great list. As being a mom of five kids I always need tips how to save money. Making your own coffee can definitely be a money saver, especially if you drink 1-2 cups everyday. All of that definitely adds up at the coffee shop! No doubt! Once you start adding up the figures it's alarming!